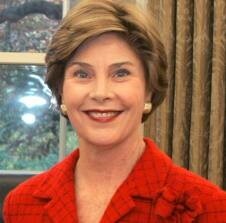 WINONA LAKE – Grace College and Seminary and The Remnant Trust will welcome former first lady Laura Bush to the Orthopaedic Capital Center on the Grace College campus. Bush will address the public, alumni and students at Grace College Oct. 6. The event will take place from 7:15 to 8:15 p.m.
Tickets will be available beginning Friday. For more information, contact John Boal at 866-448-3472. Bush will present on freedom and literacy, followed by a question-and-answers session with John Boal, Grace College and Seminary chief of advancement. Prior to the event, Bush will meet with a select group of elementary students. As a former librarian and teacher, Bush has a passion for literacy and children. In September 2011, Bush joined with the Library of Congress to launch the First National Book Festival. She now serves as an Honorary Ambassador for the United Nations Literacy Decade. She is an enthusiastic proponent of teacher recruitment programs such as Teach for America, The New Teacher Project and Troops to Teachers. Local community leaders such as Dr. Dane Miller, co-founder and CEO of Biomet, are eager to hear Bush present. “Those of us who live and enjoy the town of Winona Lake are truly excited about this once-in-a-lifetime opportunity to welcome Mrs. Laura Bush to our community and hear her thoughts on freedom and literacy,” Miller said. Miller said the event will not just benefit Grace College, but the entire Midwest region.